Juicy on the inside and full of amazing flavor! 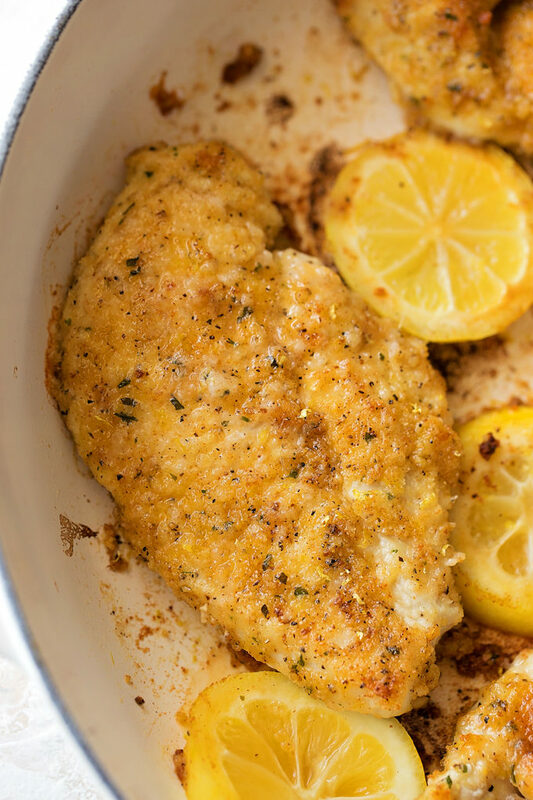 This crispy lemon pepper chicken is sure to become a family favorite in no time! I’ve made it my goal this year to simplify our family meals. I think I’ve done a pretty good job so far! However, I’m always a little reluctant to share the recipes on here because they seem so boring compared to layered cakes and homemade ice cream. But then I remember just how much WE love them and want YOU to love them too! Here’s to many more simple, savory meals in the very near future (and a lot more dairy-free and soy-free ones too because we’re going down that road again with baby #3 😫). 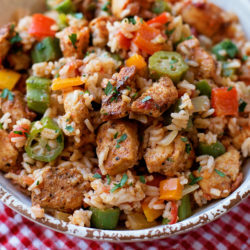 This crispy lemon pepper chicken has been a favorite of ours for a little over a year now. It’s something my kids are always asking me to make and they devour every last bite. We’re all a little obsessed. It also happens to be very easy to make. Big bonus points!! 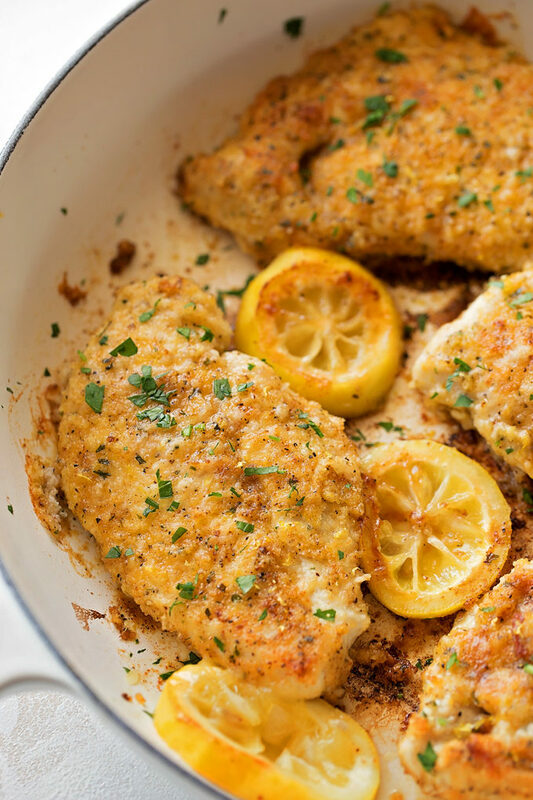 You’ll need three lemons, two chicken breasts (or 4 cutlets), good quality olive oil, panko breadcrumbs and a few seasonings and spices. 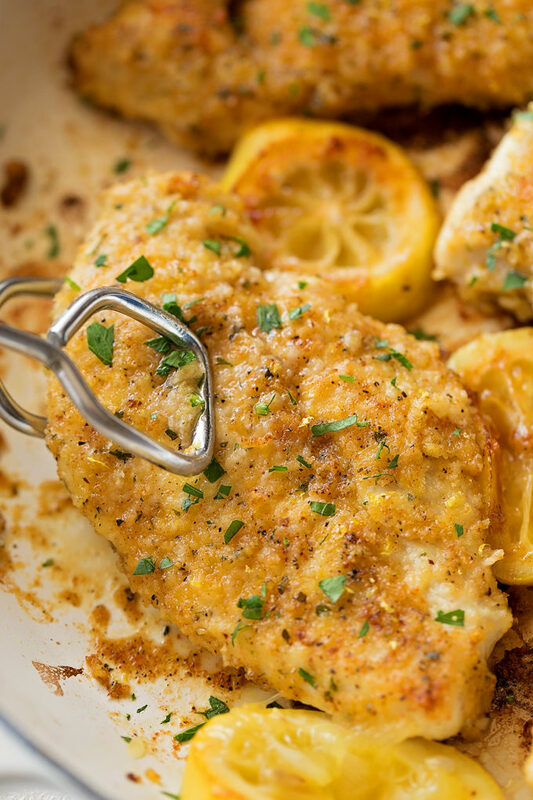 This crispy lemon pepper chicken is flavorful without being overly peppery. It has an amazing lemon flavor but is NOT sweet. It goes great with just about anything! Pasta, rice, potatoes, Asian dishes, roasted veggies- you name it. 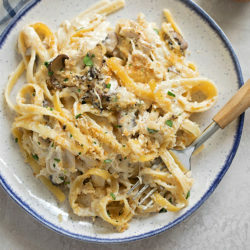 Give this recipe a try and let me know what you think! In a small rectangular dish, combine the olive oil and lemon zest. Set aside. In a small rectangular dish, combine the flour, bread crumbs, pepper, garlic powder, salt, parsley, and paprika. Set aside. Set a large deep skillet over medium heat, add remaining olive oil. Take each chicken cutlet and dip both sides in the olive oil mixture, then in the breading. Place onto a plate or piece of aluminum foil. Repeat with the remaining cutlets. Place into the pan, cook on one side for 5-6 minutes before flipping. Continue cooking for an additional 5 minutes. 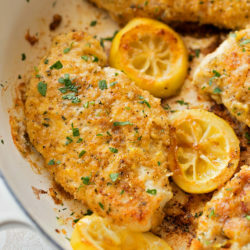 Place the lemon slices in the pan and continue cooking until the chicken reaches an internal temperature of 160 degrees. Remove from the skillet and place on a cooling rack. Let rest for 2-3 minutes before slicing and serving. – The chicken MUST be thin to be cooked throughout in a timely manner. If the chicken is not thin enough the breading will begin to burn. – Do not add the lemon slices until the last 5 minutes of cook time or they will end up burnt as well. Timing is everything! – For crisp chicken serve immediately. Delicious – not as heavy as a chicken schnitzel. Loved the lemon flavour and the panko crumbs gave a delicious crunch. Will make again for sure. Happy to hear you enjoyed it! Thanks for stopping by! Not everyone knows what a “cutlet” is, your instructions to cut the breast in half were not clear. My chicken burnt on the outside and was raw inside. Please fix your recipe to reflect what a “cutlet” is or just simply put you need two breasts sliced in half, for beginner chefs. Thanks! Glad I read the comments before trying this. Looks like a really nice dish. Going to make tonight.